Tomb of Annihilation has a little bit of everything. 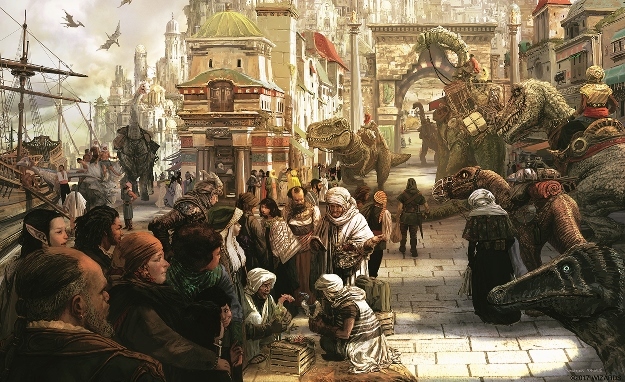 The latest hardcover adventure from Dungeons & Dragons is all about exploring. But it’s also about fighting undead. And it’s full of discovery and combat against classic D&D monsters. And, of course, it’s a meat-grinding dungeon just like it’s inspiration, the classic Tomb of Horrors. Tomb of Annihilation is half Indiana Jones-style exploring and tomb raiding and half dungeon delve, and it’s going to be a blast, especially if you like exploration, temples and tombs. If you’re something of a D&D historian, you’ll like all the little things upon which this book touches. That said, if your idea of D&D fun is more about kings, castles and classic fantasy, the flying monkeys, dinosaurs, tribes of frog people and traipsing through jungles might turn you off. But I think any D&D player or DM will dig it if they give it a chance. What it loses in high fantasy, it makes up for in heaps with high adventure. a small commission that helps us keep this site running. Here’s the story: A death curse is screwing with adventurers, nobles and, most of all, magic. The curse is trapping souls. Anyone who has been resurrected has begun to wither away, and resurrection spells are no longer working. Souls are being trapped, so those that are dying are staying dead. And anyone who has been brought back in the past is having their soul pulled away and is now on their way to dying once again. This little factoid serves as the main adventure hook, and it also makes the adventure all the more dangerous since PCs can’t be brought back to life if they get killed. Where’d the curse come from? A magic construct called the Soulmonger is stealing souls and not letting them back out. An old adventurer has hired you to go to the island of Chult and figure out what’s going on because, well, she was once resurrected and is now suffering. Here’s the catch: You’re not the only ones looking for it. And what the players also won’t know: The lich Acererak (yes, that Acererak from Tomb of Horrors) is responsible. He’s hidden the Soulmonger in the Tomb of the Nine Gods, a six-level dungeon that exists beneath a ruined city. Accessing the tomb (and therefore beating the campaign) involves exploring the island, finding the ruins, defeating the yuan-ti living there and successfully navigating the tomb’s six extremly deadly levels. The first chapter of Tomb of Annihilation details the party’s arrival at Port Nyanzaru on Chult. The island of Chult is overrun with dinosaurs, undead and (as the adventurers will later find) tribes of yuan-ti. Most Chultans stick to the coast and rarely venture outside of coastal towns and cities. To that end, the book provides a complete map of Chult for DMs as well as an incomplete hex map for the players with the interior hexes of the island map blank. That makes a large part of the adventure involve exploring the island and find ruins, old mines and lots and lots of undead. The second chapter details various locales on Chult, though the book admits it’s not a comprehensive guide. Many, many parts of the island are included, but if the crew you’re running ends up in certain places, you’re going to need to create some background, make up encounters and describe some things on the fly. It seems like a lot, but a little preparation will go a long way in this one. Chapter three details the lost city of Omu, an apparently abandoned city ruin that’s not really abandoned at all. It’s actually run by yuan-ti and occupied by grung (frog people). And the Red Wizards of Thay are also there looking for the Soulmonger. Chapter four details the struggled against the yuan-ti and their desire to bring forth Dendar the Night Serpent and, therefore, the end of the world. But once they’re defeated, that’s when the real fun begins. Chapter five, all 65 pages of it, is dedicated to the titular Tomb of Annihilation. 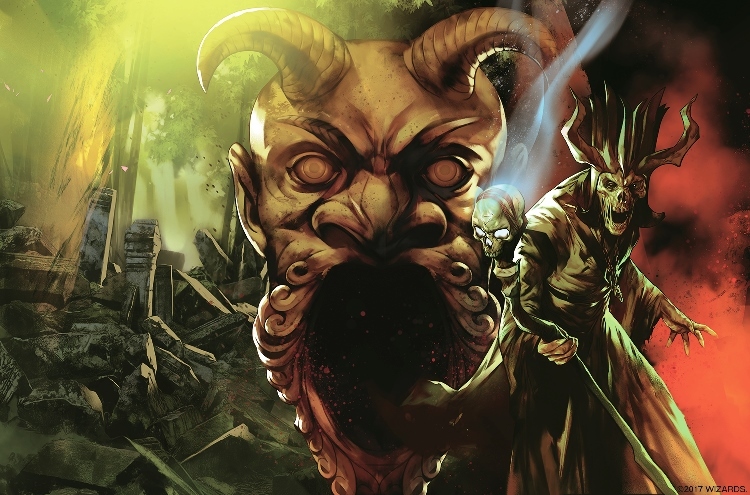 Housing the spirits of Chult’s nine trickster gods, each of which took the form of a Chultan monster and represents one of D&D’s nine alignments, the Temple of the Nine Gods was created by Acererak to house their spirits and kill anyone who enters and collect their souls. There’s lots of treasure in there. There are lots of traps. There’s a beholder lurking around. Magic doesn’t work the same way. Giant flesh golems made up of dead adventurers guard the temple. And then there’s those trickster gods, who can inhabit players and give them various powers and flaws. One of my favorite mechanics are the skeleton keys: Five skeletons with polygonal growths on their heads. They’re running around the temple, and their heads (used as keys) are the only way to access the final area of the dungeon. If you’ve ever run or played in Tomb of Horrors, you’ll be familiar with some of the craziness in this particular tomb. There’s a false entrance (of course), traps with solutions that have no particular rhyme or reason and traps designed to make players think they know how to solve it when the solution is actually totally different. The traps and monsters in the tomb are meant to test adventurers. They’ll get separated, disintegrated, drowned in wine, incinerated, attacked by an army of terra cotta warriors and possibly transported to a mirror universe with a replica tomb. It’s a deadly dungeon, and it’s going to take a tough group to navigate it’s treachery. One things I also realized: Though there are lots of traps involved in discovering and opening the sarcophagi of the dead trickster gods, there’s no need to open any of them. 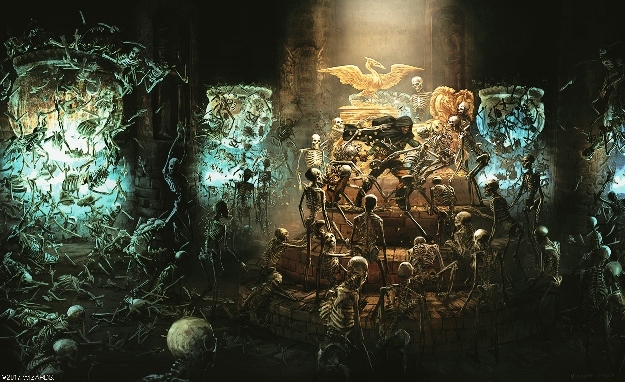 In theory, the adventurers need only survive descending to the dungeon’s lowest level, collect the five skeleton keys on the way, endure the trials presented on the sixth floor and enter the skeleton gate. Therein lies the Soulmonger and the nasty atropal that’s eating those souls. Destroy the Soulmonger, and the death curse ends. Destroy the atropal, and Acererak himself will arrive to find revenge. If your players survive, it’s going to be quite a final battle. For that matter, the entirety of Tomb of Annihilation is quite the adventure, and the tomb is quite the cap on it. My only concern: I wish the book was longer. Chult is such a huge and varied place that you could release a massive hardcover detailing every little part of it. Instead, this book details as much of Chult as it can and spends the rest on the temple. The exploration and discovery of an exotic island in the first half of the book don’t really jibe with the dungeon delving of the book’s second half. That said, the concepts of the island (especially with the gods, the influence of the undead and Acererak’s meddling) weave into various parts of the dungeon quite well. It’s a cohesive adventure even if the first and second parts of the book have a bit of a different feel. And that’s something else I thought of: If you’re only interested in running the tomb, you could skip all of Chult. But if you really love Chult, you could set an entire campaign there and more or less ignore the tomb if you really wanted to. Tomb of Annihilation is a very strong product. You can tell the designers and writers worked very hard to flesh out Chult, and they must have spent hours dreaming up such a deadly and ridiculous tomb. It might be harder than the actual Tomb of Horrors. Look no further than the appendices. There are five sections that span another 66 pages plus there’s an included fold-out map of Chult – one complete and the other for the players to fill out. In all, it’s a full book that offers a multifaceted campaign. You could spend a lot of time playing this one, and your players could run through more than a few characters trying to get through it. 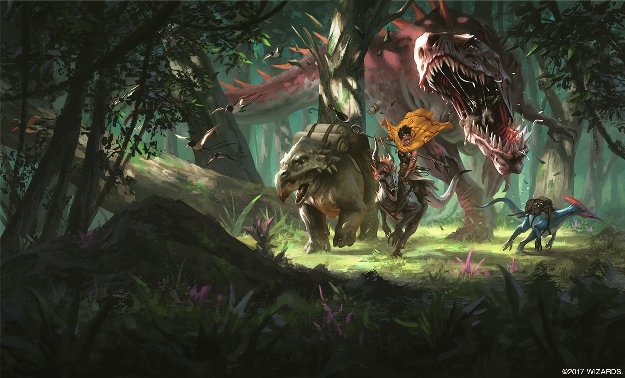 Have you started playing Tomb of Annihilation? Tell us what you think in the comments! Checked out the adventure at our local game store. The maps of the tomb are downright microscopic in size. YOU ARE BEING CHEATED ON THE MAPS. The 10-foot squares must be about 2.5mm each!!! When modules were really modules you at least were given decent DM maps. D&D adventures no longer offer full-sized poster maps. (They usually only came with one map anyway.) But many times the cartographers themselves offer their maps for sale for very little.